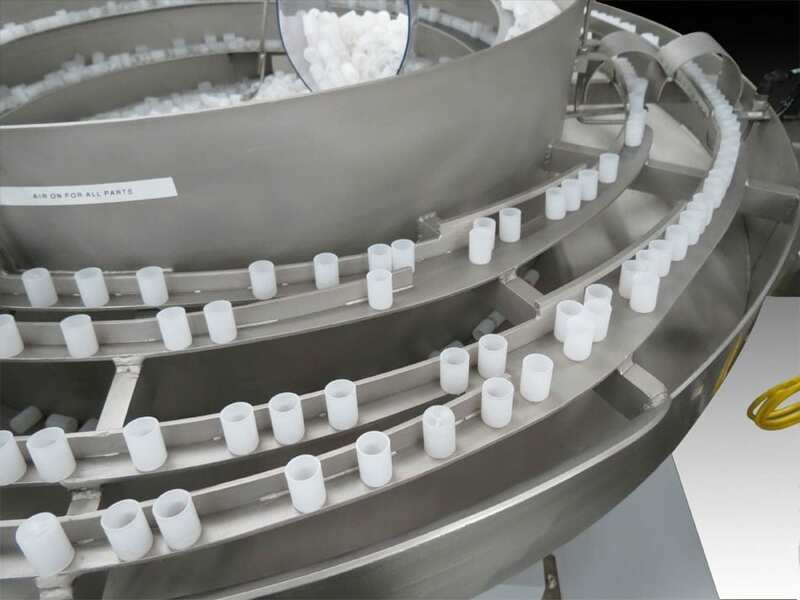 Performance Feeders specializes in the design and build of custom parts feeding, orienting and handling systems for the medical and pharmaceutical manufacturing industries. 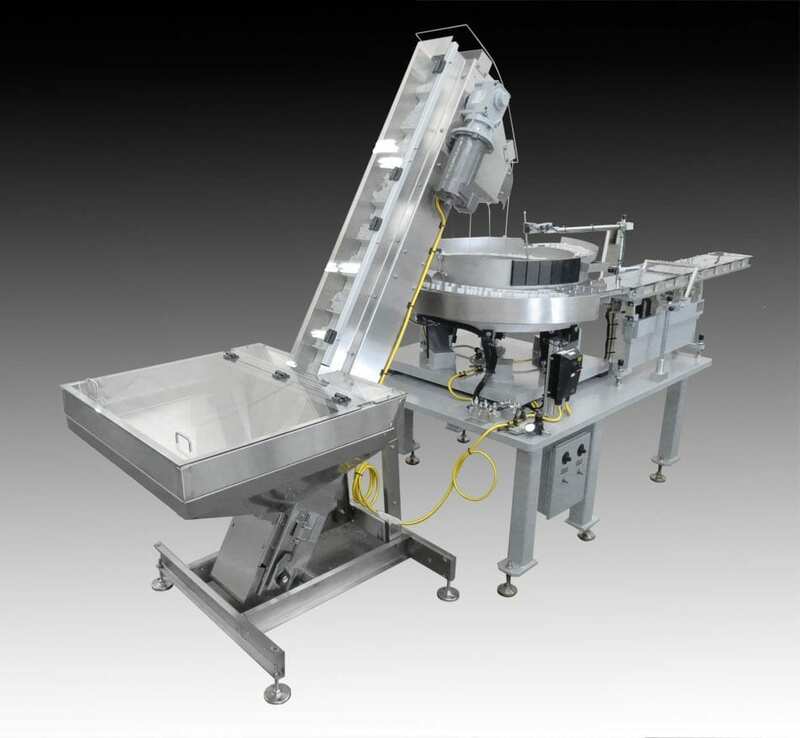 This vibratory feeder was designed to feed three different styles of cylindrical plastic parts being assembled into a medical product. The parts were all the same diameter with slightly different heights. One of the parts was closed on one end (like a cup) and the others were open on both ends. The vibratory bowl feeder ran 4 lines of parts out of the bowl and oriented them standing up. The cup part was oriented with the open end up. The 4 lines of oriented parts were then merged into 2. The 2 lines widened at the bowl discharge to match the width of the vibratory track. 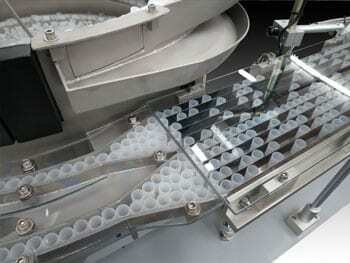 Pressure from the parts behind filled the widened discharge area, allowing each line of the 10-line track to be filled evenly. Each line of parts was separated by a thin piece of steel in the vibratory track. The track was covered with clear Lexan to allow the parts to be seen without removing the cover. Photoelectric sensors monitored each line of the vibratory track, providing a signal to our customer’s control system if the part level in any line got too low. A Hoppmann elevating prefeeder provided 6 cu. ft. of bulk parts storage with automatic metering of parts into the vibratory bowl. 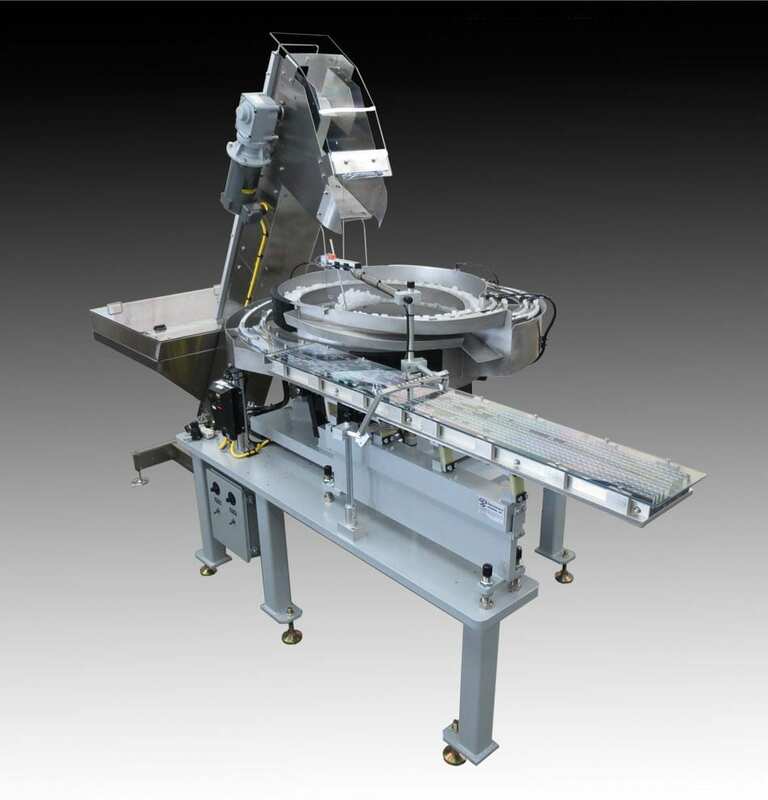 View this short video that demonstrates the parts being fed from the prefeeder into the vibratory feeder bowl for proper orientation. 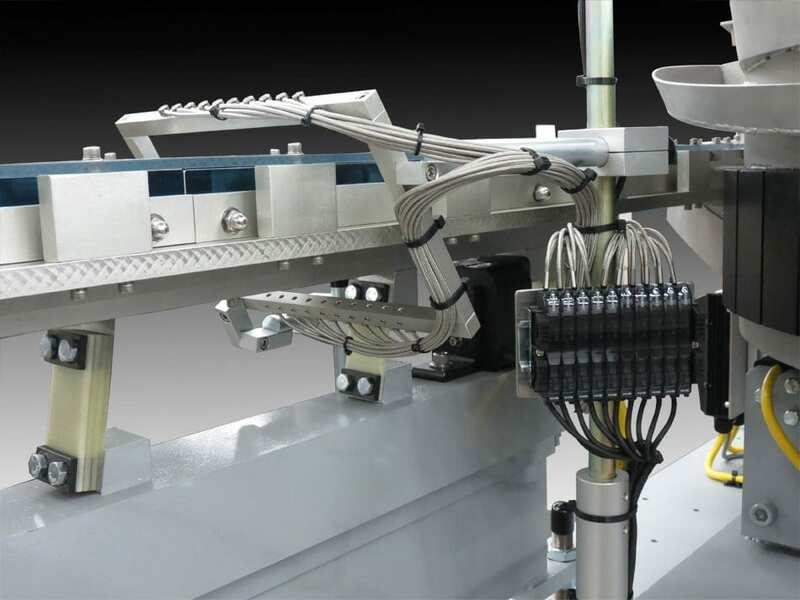 The parts are then discharged onto the 10-line vibratory feeder track which is monitored by photoelectric sensors which signal the customer’s control systems in parts levels in any line are too low. Feed rate: 30 parts per minute, per line. System built with stainless steel fasteners in areas close to parts and plated fasteners in all other areas. Bead blasted stainless steel construction. Purge gate for part changeover. Stainless steel construction with Lexan cover. 10-line track mounted to single 4-spring vibratory inline driver. Lexan covers over bin, conveyor and discharge. 1/5 HP 90V DC motor. Performance Feeders PF-200 for bowl feeder and inline, wired for control by the customer’s control system. Dart 250 Series DC motor controller for prefeeder. 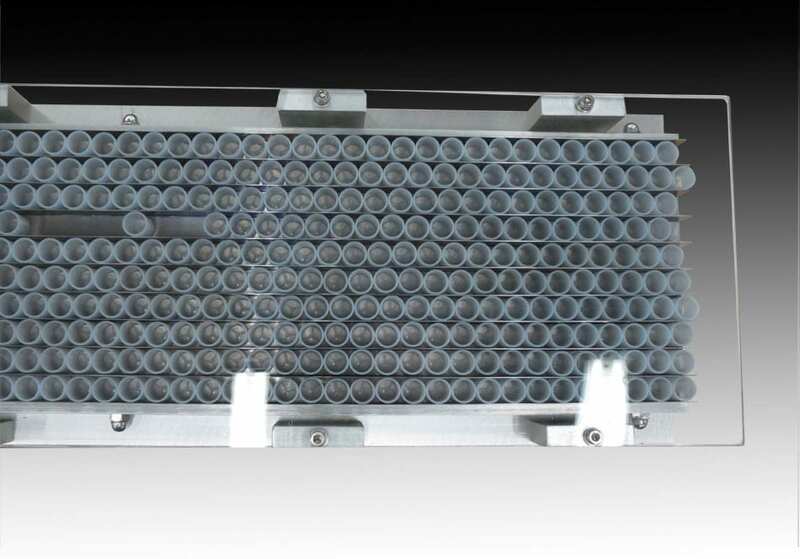 Mounting surface: 1.25″ thick steel plate with 6 legs and leveling pads. 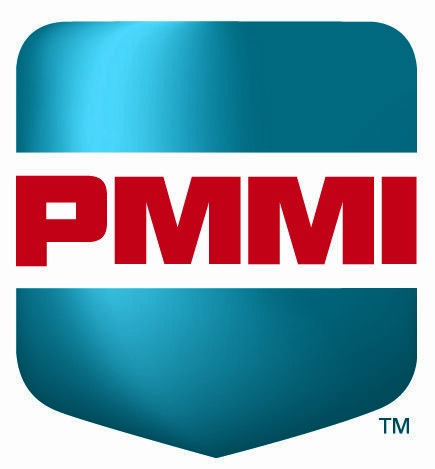 Low track photoelectric sensors on vibratory inline: Monitors each line of parts, sending a signal to the customer’s control system when the parts level in any line drops below the sensors. 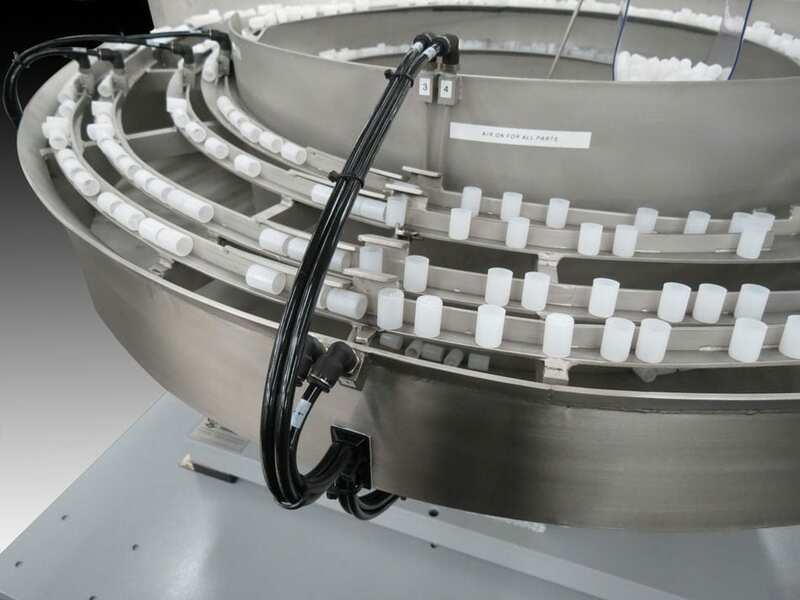 Proximity sensor on bowl for prefeeder control: Monitors parts level in the vibratory bowl feeder, turning on prefeeder as needed to maintain the proper parts level in the bowl. Solenoid valve package with regulator and flow controls for air jets.